When you think about clarity – probably the last thing that comes to mind is mud, but that’s exactly what it can do to carbon dating: provide the much needed clarity the field needs. If you want to date something, radiometric dating is the way to go; basically, you analyze materials, such as rocks or artifacts and analyze decay rates of different radioactive isotopes. Depending on the situation, you want to analyze different isotopes and decay products. When it comes to relatively recent events (counted in thousands of years, as opposed to million), you want to analyze 14-C, an isotope of carbon. Especially when it comes to organic matter, such as bones, wood or plant fibers, we compare the isotope carbon-14 and the stable carbon-12 that they contain. The main problem here is that the 14-C to 12-C ratio changes over time, so if you want to make a good estimate, you have to know the initial ratio, to make the necessary calculations which then give you the age – and this is exactly where lake Suigetsu comes in. Up until now, this initial ratio was always somewhat disputable and was always a source of possible error in terms of age estimation, but the leaf and twig fossils have remained undisturbed at the bottom of Lake Suigetsu for tens of thousands of years because the lake is very still and its bottom is completely anoxic. Now, because the sediments and organic matter have remained undisturbed for this long period of time, they can provide researchers with some of the most accurate records of radiocarbon in the atmosphere yet. They offer accurate information about any single year in the past 60 millenia, explains Christopher Bronk Ramsey , from the University of Oxford. “This is massively important,” says Chris Turney, a climate scientist at the University of New South Wales in Sydney, Australia, who was not involved in the research. He says it is a bit like a Rosetta stone that will allow researchers from a range of disciplines to work out the precise age of organic remains. “You’ve got all these different records all scattered around the planet and nobody’s known how to link them all in,” says Turney. The Lake Suigetsu record offers a way. So why is this important? Well, after you go past 12.000 years, it becomes much harder to estimate the age accurately, and a big part of this problem is (or perhaps was) a lack of a reliable background value. 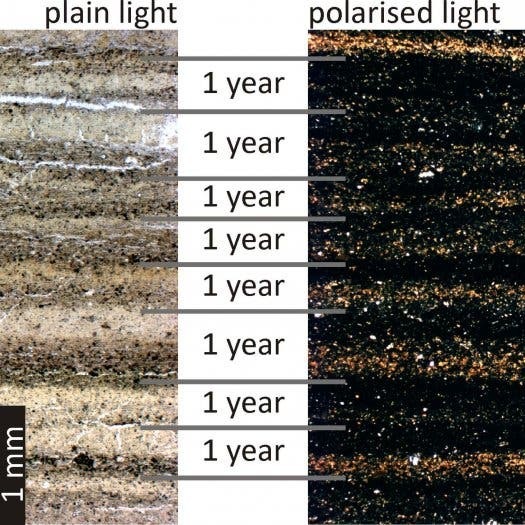 Researchers sampled a core from the lake, and as you can almost see with a naked eye, different years can be distinguished from each other in a continuous core. This can be done because the samples contain some algae, called diatoms. These diatoms cover the lakebed every year, and are followed by a sediment layer. 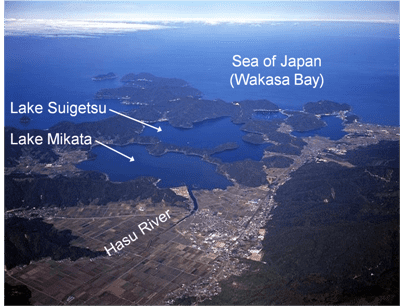 Takeshi Nakagawa, a professor at the University of Newcastle, was first involved in sediment sampling at this lake in 1993, but the cores he analyzed weren’t continuous, and lacked information about certain years.